Printmaking was particularly important to Whistler. At crucial moments in his career, he transferred his experimentation from paint to etching and lithography. Etchings are produced on thin copper plates, which are covered by a waxy, acid-resistant ground. The artist draws on this surface with an etching needle, exposing fine lines of metal which are ‘bitten’ by immersing the plate in acid. Printing ink is pressed into the incised lines, but wiped away from the flat surface. A powerful press will squeeze the ink onto a sheet of paper. 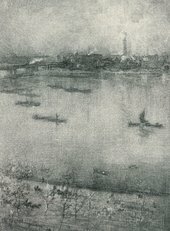 Whistler also used drypoint: lines scratched directly into the plate, without using acid. The rough edges print soft, fuzzy lines. 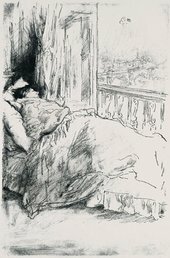 Instead of simply wiping the unetched areas of his plates clean, Whistler would leave carefully-controlled films of ink in different places, changing lighting effects and the fall of shadows. He also varied the colour of his inks, using them with a range of papers which produced further subtly different effects. Using specially-prepared slabs of limestone, the artist draws an image in a greasy medium such as lithographic chalk. If dampened with water, areas of the stone untouched by this medium will repel printing ink; ink applied with a roller will stick only to the greasy areas drawn by the artist. These can be transferred to paper in a printing press. The processes of printing will reverse an image drawn on the plate or stone. Images drawn on transfer paper will be reversed when transferred to a lithographic stone, and reversed again when printed, finally appearing the right way round. Transfer paper was also more convenient to work on than heavy slab of stone. 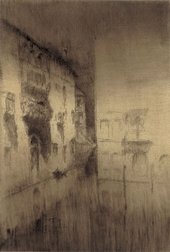 Whistler used a liquid lithographic medium known as ‘tusche’, which he applied to the stone with a brush, simulating the appearance of watercolour washes and producing extraordinarily delicate effects.